You can sometimes hear residents involved in Big Local say – we’re doing great but we’d love to get more people involved! Sound familiar? At NCVO we‘ve been researching community engagement in Big Local. We’ve learnt more about what motivates people to get involved with Big Local, and the different approaches Big Local areas are using to publicise their projects to more people and to engage and retain volunteers. If you’re finding it tough to get people involved, you’re not alone! There is no magic solution to community engagement in Big Local. Not only does it take a lot of hard work in the beginning, but there constantly needs to be efforts made to maintain the interest of those who are engaged already and to engage those not yet involved. The good news is that our research found multiple ways that Big Local areas seek to engage people, including from events and activities and by developing community spaces. Find out more about these in our case studies. Big Local is a resident led programme, where the residents make the key decisions and do the vast majority of the work. In the research we found that volunteers were engaging in Big Local to different degrees. There were members of the partnership and a larger group of additional volunteers, who ran activities and events. We often found that this ‘core’ group, the partnership and other active volunteers, were vital. Moreover, having a large number of volunteers was particularly important as areas went into delivery stage. Therefore, supporting and building the capacity of residents to help deliver Big Local is key. In Whitley Big Local there were two examples of this. One was training residents as community researchers and the other was having residents take a course in community development. But there is also a danger that volunteers can be overburdened. Some areas had recently engaged a worker, after not having one before, to relieve the pressure on volunteers. The context of each Big Local area is different. Areas have different starting points in terms of deprivation and/or participation, as our case studies showed. This means that there is no ‘one size fits all’ solutions for engagement. For example, while Brookside Big Local successfully built on existing networks, SO18 Big Local did not have such thriving existing activity to start with. One of their main engagement techniques was to get those who had shown interest at events to become more involved. How partnerships communicated with the wider community was really important, both in the sense of consulting people about what they wanted from Big Local and about what was being delivered. There were various channels for communication in Big Kirk Hallam. These included: sharing information through the website, Facebook, Twitter, print and e-newsletters and an email alert; distributing leaflets door-to-door; and establishing links with the local press and radio. A recurring theme in the research was the value partnerships placed on face-to-face interaction with residents in order to engage people. St Peter’s and the Moors Big Local introduced a listening campaign called ‘1000 conversations’. This involved door-to-door visits and events to increase resident input into ideas and activities. They felt that this could build relationships in a way that other more remote methods, such as surveying residents, could not. Ten years is a long time! 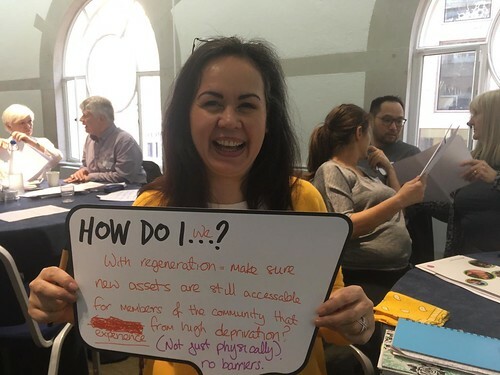 When identifying what was distinctive about Big Local compared to other programmes, interviewees emphasised, along with its resident-led approach and flexibility, the importance of the length of the programme. Having at least ten years of Big Local support and funding means that partnerships can build trust and develop engagement over time. They can build on achievements. A challenge was that it difficult to maintain interest over that time. People tend to slip in and out of volunteering, so a steady stream of volunteers need to be recruited. From 3-7 October, Local Trust will be sharing one of our case studies every day on social media and inviting everyone to share their tips and ideas for getting people involved. To get involved, search #EngageInspire or follow Local Trust on Twitter or Facebook. You can also join an #EngageInspire Twitter chat to swap questions and ideas about community engagement with NCVO researchers and Big Local areas. The chat takes place on Wednesday 5 October 7pm-8pm, all the details here. Read the full research report on community engagement in Big Local. Explore community engagement case studies from Big Local areas.